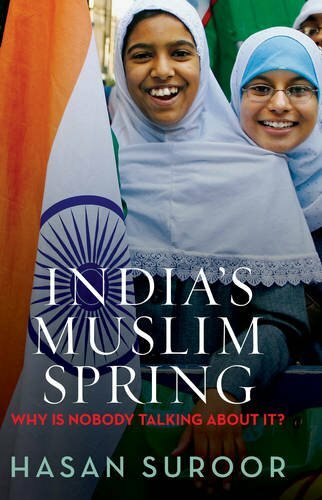 ‘This book focuses on the current Muslim mood in India, particularly that of the youth who are trying to move the community into a new – more positive – direction. Despite a marked increase in religiosity and an assertion of Muslim identity, young Muslims are more secular and forward-looking than the older generation. They also have a strong sense of belonging to India and see no contradiction between being proud Indians and proud Muslims at the same time. Keen to draw a line under the past, they are harbingers of India’s equivalent of ‘Muslim spring’. People have various perceptions about the Muslims in India and these perceptions vary depending on their political and social ideologies. 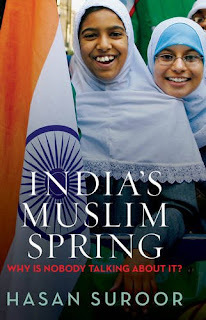 This is a book written by the London-based Indian journalist, Hasan Suroor with an intention to dispel various popular perceptions about Indian Muslims, wherein, he believes that the young Indian Muslims are starting a silent revolution akin to the Arab Spring. Before I get on to the review, I would clarify a few things; the book was released in 2014, before the world realised that the effects in Syria, Egypt and Libya were disastrous and that the Arab spring was effectively a failure. Also, the author focuses a lot on relations between Hindus and Muslims and since I belong to neither of the communities, I believe I would have a relatively unbiased view on the book. I appreciate the fact that this was not an apologist’s account; and instead he put forth a vision of hope, that young Muslims of today tend to be liberal, albeit being more religious than the previous generation, have their economic and social interests as a priority and seeing themselves as Indians. He attempted to dispel the notion that those who are deeply religious see themselves as Muslims first. He also brings out how a lot of Muslim organisations are going for reform as younger Muslims don’t blindly follow the Mullahs, rather, understand the religion and then practise the same. The author also has taken a considerable effort in narrating the history of Indian Muslims since partition, the ghost of partition, the accusation of being a closet Pakistani supporter, the Shah Bano case, the Babri Masjid demolition and what the author termed as a the Rushdie test; wherein he conceded that most of the Muslims would fail the test as some tend to justify the ban while others disagree with his views but prefer an academic debate rather than a ban. So, the book was enlightening for me, personally; because, a lot of the things that he said are points I already since I was raised in an urban environment and have many Muslim friends who are practising but at the same time, are liberal and place their economic interests over voting for politicians who treat them as a vote bank; however, what I didn’t know was how their household atmosphere was, the perspectives of the previous generation of Muslims and how it has evolved over the years. However, with all these said, based on the people whom the author interviewed, all those Muslims are from urban centres who are in jobs in the organised sector and economically well placed; meaning, they are the people who have come up using the system and normally, it is rare to find people criticise the same system which they used to come up. While he justifies it saying that though the real India lives in villages, people in cities and towns define the national mood; notwithstanding that argument, I feel it would have been better had he chosen certain samples across the countries (most were North Indian urban Muslims) and thus, I felt he manipulated the samples to get the result that he wanted in order to write the book. Additionally, the solutions he offered were affirmative action; which has been tried in the country for several years and evidently, has not been working. Moreover, he uses UK as an example to support his solution whereas, in UK, it was time-bound and eventually repealed, wherein, they shifted to Positive Action than Positive Discrimination, that is, if two candidates are equally competent, they are encouraged to increase the diversity of their organisation but are not insisted that they should hire by virtue of them being members of a particular minority. I also could not agree with some of his suggestions that the majority community should be magnanimous towards the minorities; while peaceful coexistence is what is required, in my view, there need not be any additional magnanimity beyond the basic nature of human altruism; there is no need for the majority in any part of the world to compromise for the sake of the minority. Going beyond the scope of the book, there are also certain other issues; wherein the author very freely uses the word liberal, though, to quote the British politician and counter extremism acitivist, Maajid Nawaz, ‘Globally, there is a low standard to declare a Muslim as a liberal; all they are expected to do is to condemn ISIS; we need to set better standards as even al-qaeda condemns ISIS.’ The author is also turning a blind eye to the fact that though there is a very welcoming positive change, those representing these changes are still not perceived as representatives of the community at large, to quote the British author Douglas Murray who said this as a rebuttal to Maajid Nawaz (in a different context as against the earlier statement), ‘I would like it if people like Maajid Nawaz are seen as the representatives of the community, but evidently, at present they are not, what we see are fundamentalist clerics.’ Thus, the change that the author claims will take another few years in order for the current generation to take over to see tangible changes. To conclude, I would say that the book provided a fresh insight, dispelling a lot of popular notions and expressed a lot of hope to look forward to, as a 14% population of the country having a progressive outlook is certainly great for the country as a whole. Based on whatever I have stated, I would award the book a six on ten.